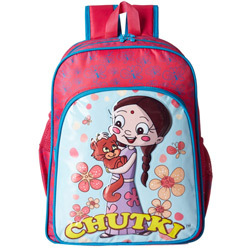 Celebrate with your loved ones as you send online this Smashing Chutki Design School Bag and increase happiness in their lives. This Bag in Pink Color bear some useful features Two Mesh Pockets, 3 Specious Compartments, made of Tough Synthetic Fabric that offers Durability, Padded Shoulder Straps and Back Padding for Comfort and Water Proof. (Dimension-12�/6.5�/16�).